Create an inviting gathering place with outdoor seating built for seasonal resiliency with attention to convenience and accessibility. Perfect for locations with abundant traffic and plenty of outdoor fun. The 46" diamond pattern table top has smooth rounded edging for comfort and safety. Adding to the appeal and convenience of the furnishing the seats are manufactured with rolled edges. Both the top and seats are sealed with a copolymer polyethylene finish. The MIG welded 1-5/8"O.D. round steel tube frame is powder-coated. 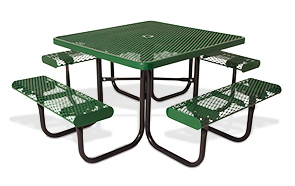 These popular picnic tables all come standard with an umbrella hole, ADA Compliant and Game Top models are available. Wheelchair and Mobility Device access square outdoor tables conform to current ADA specifications/requirements.